Hampshire Mezzanine Floors have installed a storage equipment installation for world-leading marine electrical systems organisation, Rolls-Royce Marine Electrical Systems Ltd. Rolls-Royce is committed to the marine industry and sustaining its world leading position in the design, development, supply and support of products and systems for commercial and naval customers globally. The company, that serves over 4,000 customers all over the world, requested a design for the storage of coppers bars. Previously, Rolls-Royce had the copper bar stored in pigeon-hole pipe racks which required the heavy copper bars to be carried by personnel. Hampshire Mezzanine Floors designed a cantilever racking system with removable end stops to enable Rolls-Royce to utilise a fork truck to mechanically handle the copper bar onto and off the racking. HMF designed a double sided rack with one metre arms supporting four metre lengths of copper bar with support arms capable of supporting 400 kg. On the rear of the racking, HMF designed special support arms with box section rear supports which then had support brackets running between the arms to enable hardwood plywood to be fitted to the base of the arms. Therefore, pigeon-holes accessed from the end of the racking were created to utilise the space behind the racking for storage of lightweight long items. The project, which was completed on schedule, saw Hampshire Mezzanine Floors fit steel partitioning to the exposed end of the racking which was adjacent to the main corridor for extra safety to ensure that when the bar was accessed by fork lift trucks, the pedestrians walking in the aisle were therefore protected. 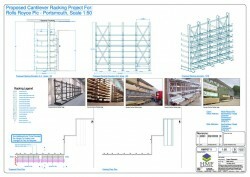 Individual rack load notices were put on the cantilever racking and HMF also provided special load notices to quantify the overall load data for the uprights and arm loading. 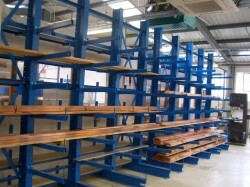 The racking was provided in a blue colour especially for Rolls-Royce. HMF provided seven adjustable arms per upright and also manufactured the upright with a special 75mm pitch to enable Rolls-Royce to adjust the arms in the future if they wished to maximise space. HMF also provided two additional arm levels for the entire installation to enable Rolls-Royce to add additional levels as their stock profile changes in the future.